The widow of John Fleming donated the land for the cemetery and the church in 1832; her only request was that the property remain the final resting place of her husband who was buried there. As far as history tells us, Fleming is still buried there; although no one really knows the actual site of his grave. The Church, which was built in 1838, was originally made of coral rock and surprisingly was totally destroyed by a hurricane on October 11, 1846. 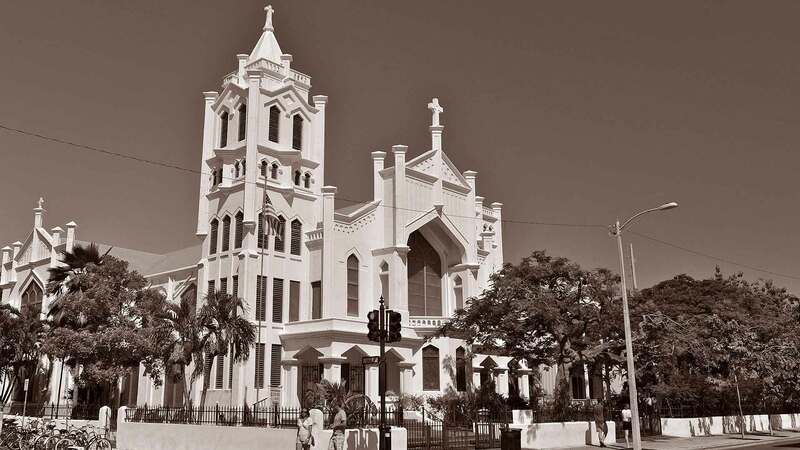 Throughout its past, this historic church has suffered through several more disasters including other hurricanes and the Great Fire of Key West on March 31, 1886. Today, the lovely church, which has been completely restored, is a popular place of worship for the community of Key West. And for those who find religious and spiritual refuge at St. Paul’s, it is a tranquil haven. But for others, especially those interested in the paranormal, the cemetery offers a totally different experience. It is here that many have had mysterious and even frightening encounters – for this is a place where spirits roam, looking to haunt all who visit. The most well known haunt of St. Paul’s Church Cemetery is that of a man in 19th century attire who appears as a flimsy white vapor. Many believe that it is the spirit of Fleming himself who seems upset. Is it because his gravesite was disturbed so many times throughout the years by all the reconstructions? Nobody knows for sure. But his apparition has startled many. Another spirit that seems to roam the graveyard is a Sea Captain who appears to take great pleasure in frightening visitors. And beware of the ghost of a man who was legendary for driving the pirates out of Key West. His spirit is angry and ready to taunt – and those who’ve encountered his apparition say that even on a day when the weather is calm, violent winds come rushing through a tree that sits right next to his grave. But the Sea Captain and the angry man are not the only ghosts that linger in this quaint graveyard. The spirits of several children have also been seen and heard – particularly near the statue of an angel in the cemetery. The children were sent to a fiery death when a pastor attempted to burn down the church. He discovered that his wife and the deacon were having an affair and went into a jealous rage. Not realizing the children were still inside the church, he set fire to the place, trapping and killing the children. Their spirits have been seen huddling around the angel; and many have heard their voices. Perhaps they find comfort by staying there and being in the presence of an angel? A visit to this historic church and cemetery is indeed an experience – if not to simply enjoy its beauty, but also to explore the possibility that ghosts really do exist. Discover the haunted side of Key West on the Ghosts & Gravestones Tour.